Zeliha Esra Karayeğen, the 23-year-old daughter of jailed journalist Ibrahim Karayegen was put in pretrial arrest on charge of membership to a terrorist organization, on Friday. 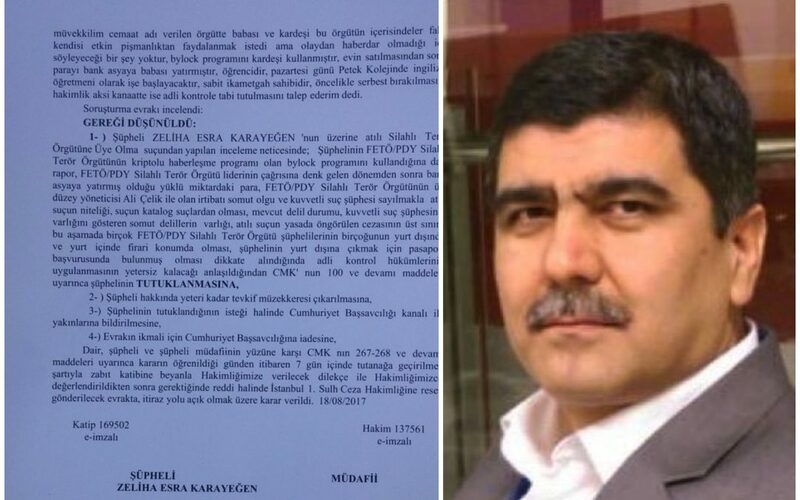 A former managing editor at the government-closed Zaman newspaper, Karayeğen was reportedly detained at Istanbul Atatürk airport while he was fleeing Turkey’s post-coup crackdown on dissident voices that put more than 270 journalists behind bars. According to journalist Harun Odabaşı, Karayeğen’s daughter Zeliha Esra was also detained and sent to jail on charges of membership to the Gulen movement, which the government accuses of masterminding the July 15, 2016 coup attempt, and considers a terrorist group. The movement denies involvement in the failed takeover, and terror charges. Among the evidences for the daughter Karayegen’s arrest are her alleged use of ByLock mobile app, her passport application and the allegation that she deposited money into the now-closed, movement-affiliated Bank Asya. “Many people sought over Gulen links live as fugitives abroad,” the judge said as part of his/her decision to arrest Zeliha Esra. The government claims that ByLock was a primary communication tool among sympathizers of the Gulen movement. “Karayegen’s daughter was arrested at the the police station where she had visited only to get a document required for her job application. 23-year-old Zeliha Karayegen has never used the sim card registered on ByLock app. But neither the prosecutor nor the judge noted took notice of that,” Odabasi tweeted on Friday.